Missing that Critical Digital Sales Strategy ? Is your Enterprise Technology Platform Agile for Industry disruptions? Talk to us about our Cloud, AI/ML, DevOps, MicroServices Offerings. Aadhick Solutions has over a decade of experience in implementing Solutions that helps our Life Sciences customers meet the ever evolving landscape/challenges around Regulatory, Compliance, Personalized care. Challenges: Single view across Digital, Sales, Marketing, Rx, Alignment areas. Solution: Our Master Data Management Advisory & Solution practice enables single view of organization and operational data eliminating redundant Silos. 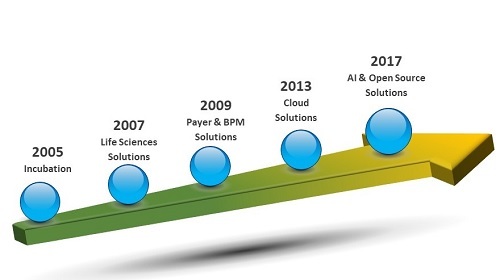 Solution: MDM's, Patient Platforms, Copay, Surveys, PBM's, Speciality Programs - We have done it all. Connect with us know to know more on our Integration as a Service. Solution: We have serviced the Lifescience Consulting market for more than a decade and have a niche pool of technology consultants with Lifesciencs background. Aadhick Solutions is uniquely positioned in helping the Payers navigate challenges around Population health, ACO, Value-base care, Regulatory reporting and much required solutions that can provide better insights for better care resulting in reduction of medical spending. Our expertise include solutions and services on the most popular Core Payer platforms. When it comes to our customer organizations challenges in enabling that perfect technology that fits their unique needs/situation, decisions on Product selections, Aadhick is among the first organization called upon by our customers. Armed with a tech savy leadership along with our lean Agile & Lean process, we can help you through your technology transformation projects. Solution: Our DevOps team can help with assesment of your existing platform, develop the right automation solution and manage CI/CD process. Solution: Benefit from our Open Source implementation framework. Extensive experience implementing open source products from Apache foundation, Python, Scala, GO, RoR, MEAN implementations, etc. We are a technology agnostic organization. At Aadhick, the selection and development of exceptional talent is our highest priority. Our primary goal is to deliver exceptional value to our customers and exceptional talent therefore is critical to our future growth. If you are passionate about technology, we would like to hear from you. Our Current open positions are listed below. We are one of the premier boutique new class of digital service organization that provides a unique blend of Strategy and Consulting.Our organization processes have helped us be nimble and agile and we bring the same agility to our customers. We have a track record of exceeding our customer expectations. Our journey started in 2005 and we have progressively transformed our organzation. We have passionately supported the Life Sciences domain since 2007, backed by our deep domain expertise in every stage of the business right from clincal discoveries to product commercialization. We have always understood how other parallel organization within domains space evaluate and solve challenges. In 2009, with deep understanding of the Healthcare domain, we started our Payer solutions practice and never looked back. Our solutions have brought in customer satisfaction and success which parallel organizations have only "planned" or showcased on their presentations. Our nimbleness and philosophy of customer first has helped us transform on our journey. In 2013,We started our Cloud services and continued to evolve. In 2017, we started AI & Open Source services as organization adoption and needs evolved.